In the desolate landscape, among the ruins of a forgotten city a proud Space Marine was standing in silence. The black and white livery identified him as a Son of Dorn, a Scion of Sigismund, a Black Templar. His hand was resting on his oversized power sword with its tip buried in the dry ground and its hilt at the shoulder level. Ruby-red eye lenses were scanning the horizon in a lazy fashion. He was not in a hurry. From a distance another figure appeared. It wore bone-white robes with a hood over his helmeted head. Beneath his robes, the dark green armor was visible. The Templar fixed his gaze on the newcomer as he approached. -	Ave frater, the Dark Angel saluted bringing his fist to his chest. The Templar was silent. Motionless. He was just staring at the newcomer, his helmet betraying no emotion. The Dark Angel met his gaze but the purpose of this meeting was pre-determined. With a sound that could be interpreted as a sigh he took a scroll out of a purpose-build cylindrical container that was hanging from his waist. With no further words he handed the scroll to the Templar who raised his other hand to accept it. -	This is an acknowledgement, the Dark Angel said, an admission. Revere it because it is not something the Dark Angels do often. -	Do you even understand the honor you are bestowed with? As the Templar remained silent and the purpose of this meeting was concluded the Dark Angel turned to walk away. The Dark Angel turned again. Let me just start this by congratulating every single participant for the amicable manner in which the whole event was run. Not only people followed the letter of the rules but also the spirit, and disputes (whenever they were raised) were ALWAYS worked out in a friendly manner of mutual understanding. The event flowed, there were no obstructions, no tiresome debates, everything was smooth in a climate of friedly competition and dare I say faction patriotism. But E TENEBRAE LUX had a twist: Those that have unfinished vows in the end of the event are penalized by having all their previous completed vows nullified. In total the amount of points that were subject to the above penalty was 3,926 pts. I have to say this is a VERY small amount of penalties and I have to point out the commitment of the community to see this event through. It was also a lucky coincidence to some extent as real life can throw a number of unforeseen situations to interfere with our hobby. Yes 71%! Congratulations to all for achieving such unprecedented levels of success! The B&C community embraced this event wholeheartedly and it shows in the numbers!!! From the above it’s obvious that the last week saw frantic activity as each forum scrambled to complete as many vows as possible and plug any leakage from incomplete vows still hanging out there... So last week alone accounted for more than a third of the total completions of the 3-month event. I was expecting a spike in the last week, but this? Wow – just wow! 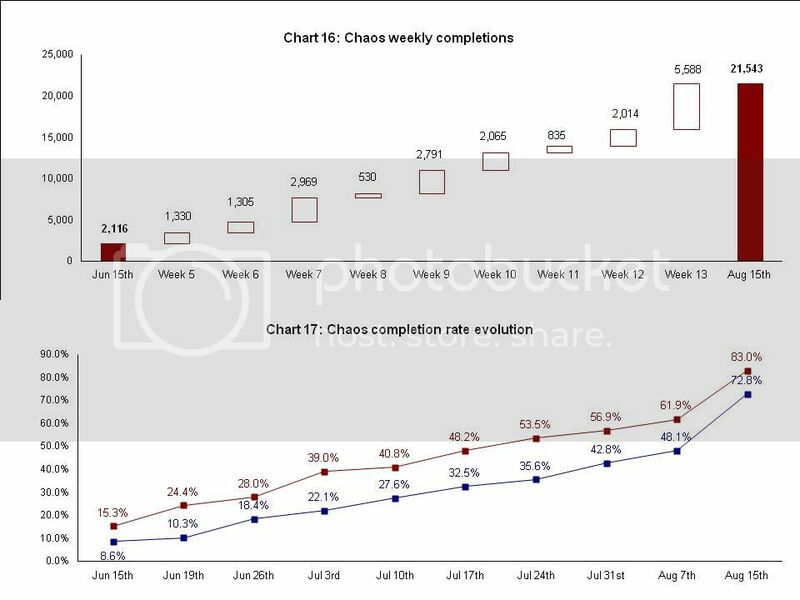 In Chart 3 it is evident that the BTs had by July 17th (end of Week 9) a clear gap to the rest of the forums which (Templars being Templars) never allowed it to narrow. 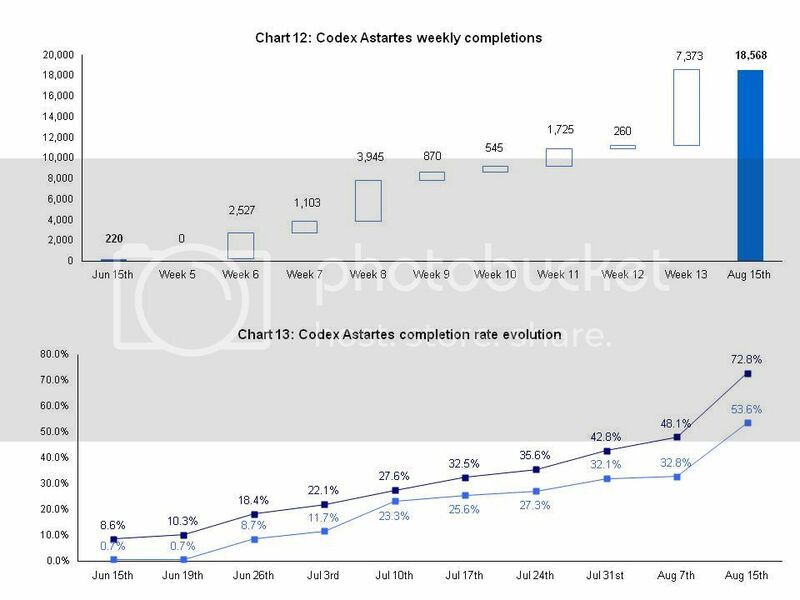 Even in the last week of the ETL and while still enjoying a huge advantage the BTs kept completion rates strong, earning the highest weekly completions in the entire event. And a good thing too considering the DAs also sprung into action delivering shockingly high completions in Week 13! The DAs had a slow start – something that ultimately cost them the first position. However they sprang into action in the last minute increasing their completion rates and securing the second position leaving the Wolves behind. However until Week 12 things looked like it could go either way, with the Wolves having some heavy artillery in reserve while the DAs seemed to be close to breaking point. However Week 13 changed everything as a lot of DAs first vows declared timely completions pumping the total amount of points a good 10k more that what the Wolves could muster. The Wolves showed strong commitment completing a huge amount of super vows but despite everything their smaller number of participants showed and in the end they just could not threaten the first position or second position. But they did third leaving substantially behind the BAs, the Codex Chapters and Chaos! The actual fight took place for the 4th position between BAs and Chaos. Here Chaos beat the BAs by only 56 pts (!) after all penalties were applied. Was that close or what? This demonstrates that no vow is too small and everything counts! The Codex Chapters came in last (excluding the Ordos). They had quite an enthusiastic start but somewhere along the road lost their momentum and remained idle. Still Week 13 was a revelation especially in the UM front that delivered huge amount of points. Congratulations to all for making E TENEBRAE LUX such a great success! 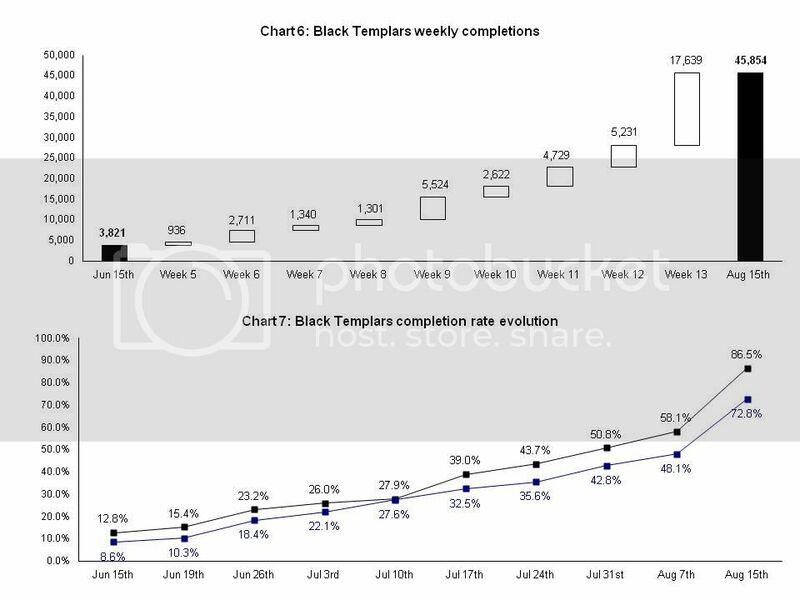 Chart 6 shows that there was not a single week where the Black Templars failed to deliver sizeable completions with Week 9 making the big difference not only because of the 5.5k points completed (a large number obviously but not unique in the ETL) but mostly because the rest of their rivals had a particularly weak performance... In Chart 7 we can see that the Templars never dropped below the average completion rate of the ETL which (given their sizeable submitted vows) guaranteed them victory. Furthermore it was the highest completion rate in the entire ETL granting them the title of the most committed forum of the Challenge! That and an amazing finish in Week 13, where they really went to the limit adding 17.6k pts and delivering an astounding 45,9k pts (before penalties)!!! The Templars had a strong case since the beginning. A relatively high number of participants, a good mix of low/high value vows and a fanatical zeal that is to be envied. The way they played it was very smart by completing and re-vowing early on creating a multiplying effect on their recourses. The creation of a Strategy thread where they interacted and discussed the progress of the ETL and although other forums also developed similar threads, they were never as vital as was the BTs. Here I need to mention that Brother Darklight was instrumental in this effort launching the aforementioned BTs Strategy thread and driving the BTs zeal to new heights. I think he had a lot to do with the BTs overwhelming victory! When I was designing the ETL back in April and May, I was envisaging a close fight between the Angels of Death (ala the old 2nd ed. Codex) for the first position. It’s probably because of the Blood Angels reputation as THE painting forum (twice LPC winners in 2010 & 2011) and the Dark Angels recent landslide victory in the latest LPC 2012 that created strong momentum on the painting front. Alas it was not to be. The Blood Angels had good participation levels and a good mix of vows. 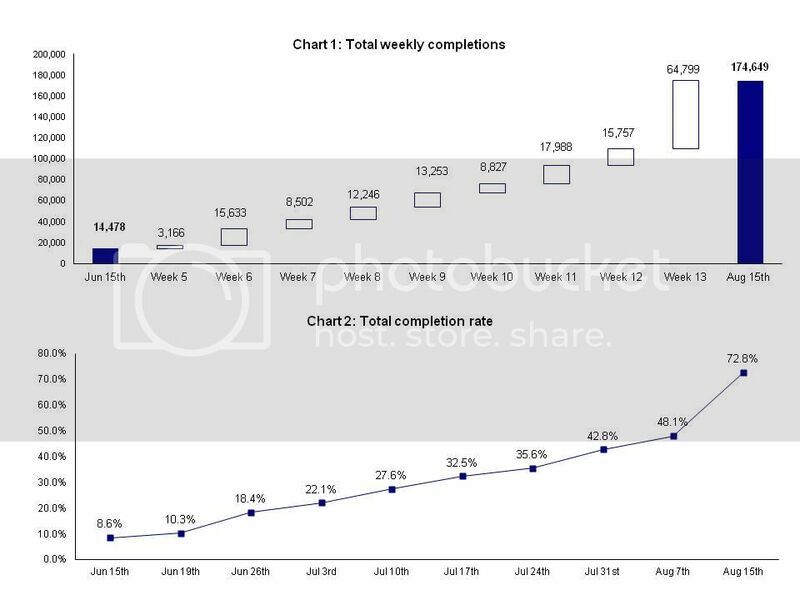 However their sluggish performance in the early stages of the Challenge (hardly exceeding 1.5k pts at any given week except the last of course) deprived them of the potential to re-vow thus gaining a multiplying effect on their vows. Their completion rate was steadily below the ETL average (and at times 10 percentage points lower!). The very strong finish in Week 13 proved too little too late and was not enough to get them ahead of Chaos despite Chaos suffering higher penalties. The interesting thing is that only 24 people managed to complete at least one vow vs. 41 for both the BTs and the DAs. In fact they utilized 52% of their resources vs. 63% for the DAs and a most impressive 77% for the BTs. And as the metric points/vow lost some of its meaning given the sheer amount of vows especially in the closing days if the ETL the metric points/participant always speaks the truth... so with only 765pts on average, the BAs not only failed to mobilize their resources but those that did, did so with moderate sized vows instead of trying to compensate for their inactive brothers. Let’s face it, the BAs need to restore their honor on the painting front soon, or else their once dominating presence will be forgotten... I believe that the BAs would have benefitted if they had used their own strategy thread more, so they’d focus their efforts and possibly achieve a materially better position. Here I need to mention a true Hero of the Chapter, Taranis, who saw the situation for what it was early on and ceaselessly encouraged his brothers to take up arms, ermm… brushes, setting up a Strategy thread which unfortunately was not effectively utilised. Still he maanged 9 vows and contributed the most points from any other Blood Angel! … it was too late. 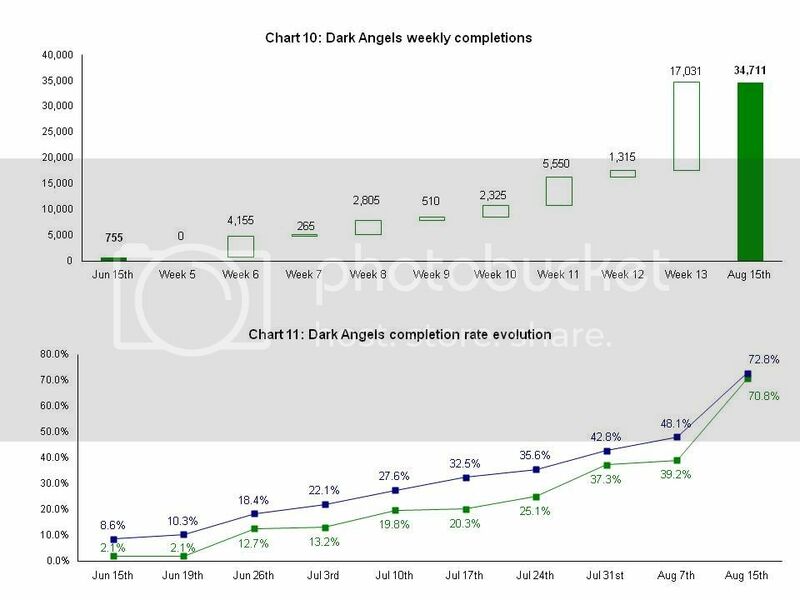 All the Dark Angels managed to do was to secure second place as the sluggish performance early in the challenge deprived them of the opportunity to re-vow. An interesting comparison to the BTs is the total amount of vows: 107 for the DAs vs. 150 for the BTs. This coupled by the fact that the BTs achieved a completion rate of 16(!) percentage points higher than the DAs made the bid for first position of the latter unattainable… Another interesting point was the points/participant. Here the DAs (muck like the BAs previously) had a non-threatening number of 755. Given that the active participants were exactly the same with the BTs it is obvious that this number should have approached 1k. Which brings us to the heart of the problem: No completions of some the larger vows and late completions of the mid-sized vows deprived the DAs of the multiplying effect that the BTs played so well. The fact that 41 people made it (the same absolute number as the BTs) is just not enough. The 107 vs. 150 vows underlines the impact of the multiplying effect of re-vowing. If there is a lesson to be learned is that a high number of participants alone cannot win such a competition – solid completions do! So keeping the momentum is important. The weeks of July is where the ETL was won and lost with Week 9 making the difference! I would like to mention here the effort of Grotsmasha who delivered 3,065 pts through six vows with the first being 1,9k! This was the kind of performance that (if adopted by others) would have brought the DAs to greater results. The Codex forums never came close to the ETL average completion rate. They had a strong Week 13 (like everybody else) but even then it stood some 20 percentage points below the average. Again the inability to exploit their resources and see second and subsequent vows been completed cost them dearly. The total vows pledged by the three forums combined were 62 – again the comparison with the Templars is, well… They also suffered from the late 1st vow completion syndrome (especially the UM that virtually all their completions came in the last couple of days) depriving them of the potential to re-vow. With only 52% of their participants making at least on completions and with an average points/participant of a very average 737 they really could not threaten the leaders of the ETL. Also a number of hefty vows never made it to completion throwing the burden to the smaller sized vows creating an impossible situation... I also think that the three forums comprising the Codex faction were somewhat disjointed, despite the pretty successful Strategy thread set up by The Yak and carried on by Arizonajirt. A positive aspect though, is that the Codex is the only other faction apart from the DAs that had ZERO penalties. Just to add a bit more flavor, the weakest performance was that of the Liber Astartes with a completion rate of 27% as opposed the 65% levels of the Index Astartes and the Ultramarines. A special mention should go to Arizonajirt for his efforts accounted for 30% of the entire Codex faction completions, contributing 5,515 pts through five progrssively diminishing vows! Well played Arizona! Aaah the Wolves. The craziest bunch in the entire ETL! They were few with only 36 participants. The only way they could make a difference was to achieve a high completion rate and to keep taking further burden on an individual basis to see this through. Well they did it! 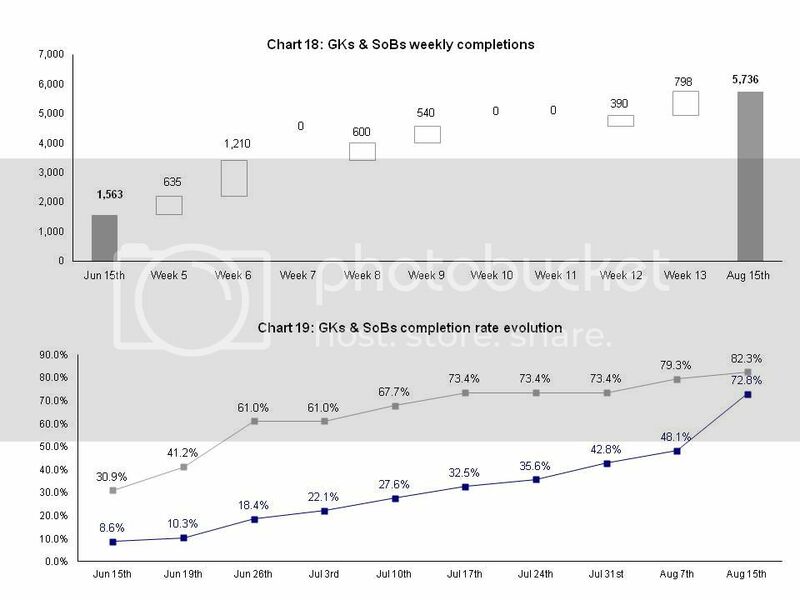 But as it turned out their completion rate was bang-on the ETL average and they only 51% of their participants came up with a completion. So the really high points per participant (1,041) should have been even higher for them to threaten first position. It is evident that there is so much the 19 active participants could do to take the Wolves to the first (or second for that matter) position. BUT THEY DID MANAGE THIRD!!! 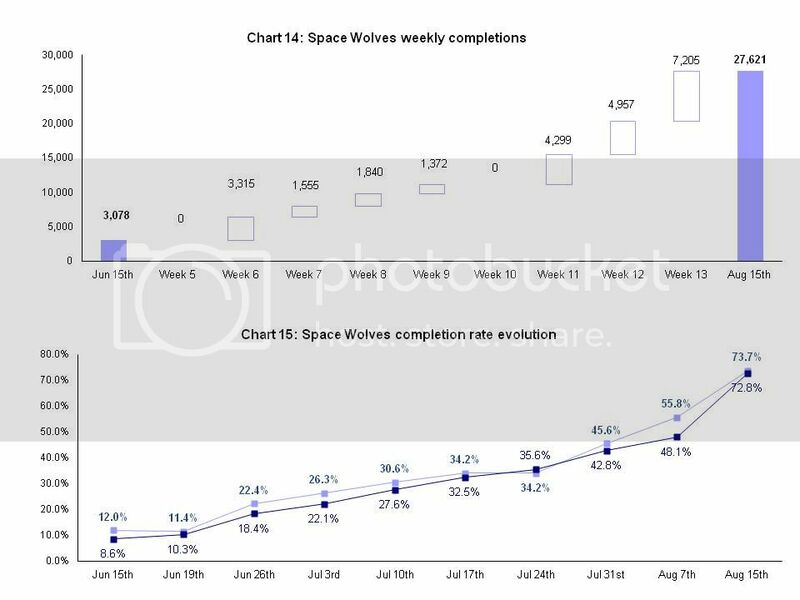 Weeks 11 -12 & 13 saw the Wolves coming up with completion of super vow upon super vow managing 16.5k pts in this three week period. At times they were second beating the DAs to dust (helping them indirectly to come out of their slumber) and their momentum and morale never wavered – in true SW style. This is a classic example where low numbers of participants handicap the faction no matter how driven and focused the active participants were. A special mention should be made to Wolf Lord Kieran (WLK) for completing the largest single vow in the entire ETL of 3,999 pts! Such headstrong attitude of ignoring the odds and fighting on assuming huge point burden individually would have worked wonders if only the initial participation was broader… As it happened the third position is something the Wolves should be proud of as they beat both the BAs and the Codex factions that appeared better positioned back in June and Chaos that also became a threat in the latter part of the event! 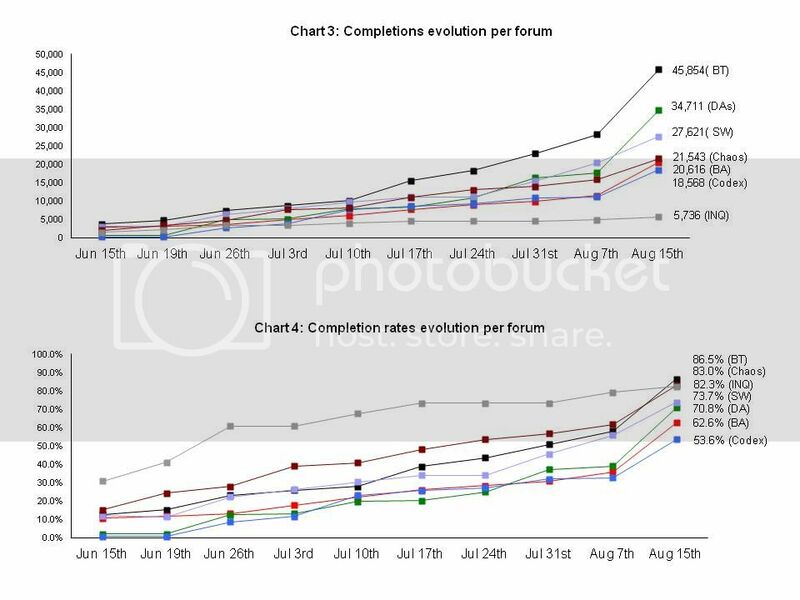 For one thing the completion rates remained steadily above the average of the ETL ending up with 10 percentage points higher! Such strong performance was supported by a number of small or moderately high value vows as well as a few super vows that propelled Chaos to 4th position sending the Sons of Sanguinius to 5th. Unfortunately, the low initial turnout and the low points/participant kept them from a better positioning. It was a case of Space Wolves but even more pronounced! Here I need to mention steve shields that in his unparallel drive managed to complete the highest amount of points in the entire ETL!!! And was the only participant to do 7 vows (there were more and there were less but only steve shields managed exactly 7) so yeah, Nurgle will be pleased indeed! Well the Ordos were always a connoisseur, niche part of the B&C community. They fought hard and achieved very high completion rates underlying their commitment to the ETL. Grey Knights and Sororitas: I salute you! Obviously their tiny numbers meant they could not really challenge the more numerous factions but their dedication to the Emperor’s cause shines through! With the resources they had the managed a completion rate of 82% (10 percentage points higher than the ETL average and an involvement rate (i.e. active participants) of 62% - no mean feat for the brothers and sisters of the Emperor’s most Holy Inquisition! Well, the ETL was predominantly about group effort. But a group is ultimatelty a bunch of individuals and unless we recognize the individual effort, the whole event is meaningless. To that end the Inner Circle is prepared to recognize individual performance in the form of banners that can be used in the signature of all those that participated in the ETL. We further distinguish the commitment of participants by awarding ONE WHITE PEARL PER COMPLETION AND ONE BLACK PEARL PER FIVE COMPLETIONS. Names in alphabetical order to make it easy to spot yours. If there is a mistake, please feel free to take the banner you feel it’s the correct one and notify me so I can made the appropriate adjustments). Edited by Captain Semper, 18 August 2012 - 05:32 PM. This banner was designed to sit alongside the Badge of Honor and you can see the fading symbol of the DAs fading on the edge of the Badge of Honor matching the edge of the Badge of the Champion! In fact the same applies with the Badge of Shame! If you want to honor your battle brothers you can still use the Badge of Champions alongside the Badge of Shame. That way you can say that although you failed, your battle brothers still won the day! These badges are designed with the same principle as above to sit next to the Badge of Honor. Good luck fitting everything together Brother Darklight! BUT THAT’S (still) NOT ALL! The Most Vows Completed: Brother Darklight (BT), Chaplain Cliff (BT) & Nards08 (BT) all three with 10 vows! 1. To motivate people to paint their miniatures in an environment of friendly competition. 2. To promote faction loyalty and have the members interacting with each other to achieve a common goal. 3. To create a large pool of knowhow and techniques and exchange of experience between B&C members across all boards. Hail, my Power Armoured Brothers and Sisters! As we've reached the end of the E Tenebrae Lux painting challenge I wish to convey a few rounds of thanks. No doubt that this first one has been said by the good Captain a dozen times over by now, but thank you to everyone who participated. The support you all showed for your Chapters, War-bands, Factions Etc., made the E Tenebrae Lux challenge fun to take part in! The level of competitiveness that originated from this painting challenge was a significant motivator in the eyes of quite a few of us. Secondly, Thanks to B&C for, well, existing! 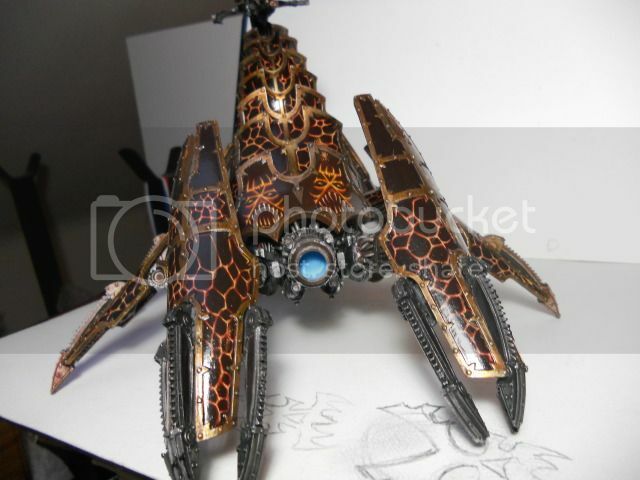 Without this forum, a lot of us would have to resort to places such as Dakka Dakka, and other places that wouldn't support or even allow such things like this painting Challenges. And lastly, thank you Captain Semper. Thank you for bringing this brilliant idea to light. Thank you for your hard work and dedication to moderating this challenge. No matter what the final totals say, we all walk away from this with something. Some of us have been drawn further into the community. Some of us have learned new painting techniques from practice. Some of us have learned new painting techniques from others! And some of us even walk away with a fully painted army that, were it not for the extra drive of competition and teamwork, may very well still be sitting unpainted or incomplete. I, for one, am one of those individuals that has benefited greatly in these areas. I'd hardly had any of my Templar force painted. I wasn't very confident in my abilities as a painter, and was more so involved in 40k for the gaming aspect. When the E Tenebrae Lux challenge appeared, it was like something was drawing me in, just to see what I could do for my Chapter. It gave me a chance to learn by seeing others' painting techniques and to practice my own. The additional motivation has lead me to now have my entire Templar Crusade completed with a quality that I am now proud of, and I'm certain I'm not the only one! I've been monitoring the 'after' pictures that everyone has been posting in all of the sub-forums and everyone should be proud of their efforts! All of these models will look sharp both on the table and in the display case. The motivation and care that went into these models was only amplified by the painting challenge. True, there are things like the annual Sub-forum Painting challenges, 'Expansion Crusades', and the like, that all boost productivity and skill, but this challenge seemed to bring people together for the sake of a common goal, for the glory of their Codex. This strengthened the community as a whole! Well thank you Brother Darklight! One of the issues that I had to overcome was that since the ETL was originating from Dark Angels forum, it had to convince people that it would be run fairly with all members being treated as equals. So transparency played a big part since the beginning through public display of data, thus allowing people to monitor their own progress as well as the progress of their rivals. Weekly Updates was another innovation that allowed me to distribute further info and heighten the sense of competition showing where each faction stood and, at the same time, share some of my thoughts with the community as I had the privilege of having a much broader picture. I particularly enjoyed the “Strategy” threads that popped up, where participants took it upon themselves to organize their efforts and further add to the faction loyalty and friendly competition elements. At this point I would like to say a few thank yous of my own. First of all I would like to thank all of the participants that their enthusiasm made this project possible. It’s good to know the B&C community is a lively place with people who are enthusiastic (dare I say fanatical) about our hobby. The collective drive of the Frater was the ingredient that made the ETL the success that it was. I would also like to thank the B&C Administratum for allowing the ETL to materialize in the first place. Given that this was not an “official” B&C event but one that was created by the Inner Circle – a shadowy organization of the Dark Angles Chapter- and it must have taken a lot of goodwill to allow the Challenge to go ahead. Finally I would like to thank the Inner Circle for supporting and participating in this endeavor and in particular The Shadow Guard that helped immensely on the presentation front – another chief objective of the ETL. All the images used in the ETL including the banners are Shadow Guard’s work – so thank you again Supreme Grand Master! Personally I had enormous fun running it and interacted with tons of people that I otherwise wouldn’t. I also saw a number of participants making their first posts ever in the ETL, something that made me particularly proud. I think that painting miniatures brings people together much more than discussing rules, tactics or (Emperor forbid) background! So now this is the opportunity to make your own comments about how you experienced the ETL and (most importantly) feel free to present pictures of your completed vows along with the vows themselves in order to create an unofficial Hall of Fame for E TENEBRAE LUX 2012! Edited by Captain Semper, 18 August 2012 - 04:49 PM. WoW! That's quite the presentation you've got going Cpt Semper. :tu to you and your effort collating all this info. FOR DORN! FOR SIGISMUND! FOR THE EMPEROR! 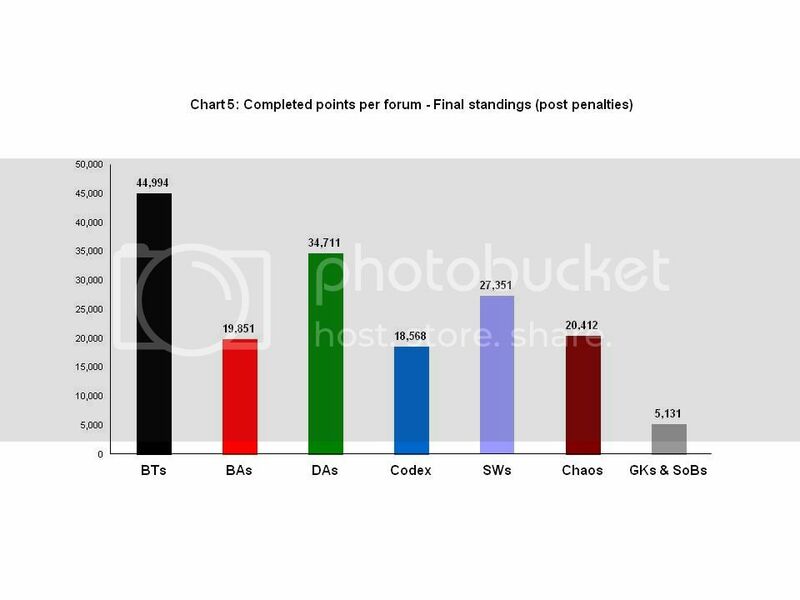 I'm proud of my BT battle-brothers for their achievement, something I unfortunately couldn't contribute to due to coming to the hobby - as well as the forum - much too late! I'm not sure why that time restriction for the first vows was there, but I suppose it was for a good reason (just so there's no misunderstanding, I'm just curious, and not feeling "negative" about it). But regardless, it was fun seeing the challenge progress for the last four weeks. So many beautiful models completed in the BT forum, and while I haven't really looked at the completions on other Chapter forums (which I intend to) yet, I'm sure there's a lot more goodness waiting for me there as well! Although I was unable to complete my vow, I did have a blast trying and would like to throw a huge thank-you to Captain Semper for organizing this event. I'm going to start coverting up a slew of models in the hopes that we'll be running another one of these next year. Cheers brothers. Thank you so much for organizing this event. I personally feel more a part of the community having had the motivation to not only post comments on others' minis, but to show some of my own as well. It's something I've always wanted to try, but never quite had the courage for. Your leadership in this regard is invaluable. 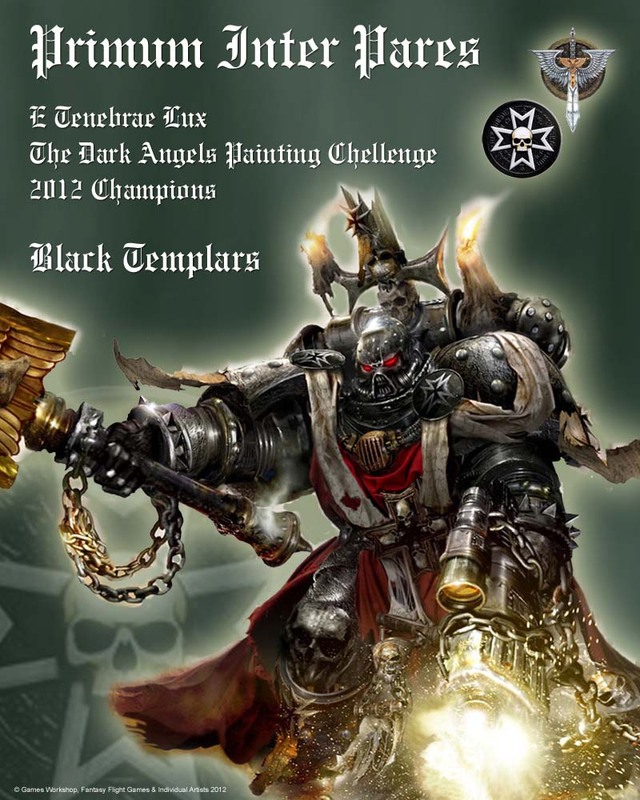 Congratulations to the Black Templars, and to all participants. And this was great fun by the way. Good to see so many members motivated. I, too, want to apologize for not being able to complete my vow. I will wear by badge as a reminder of the shame if have brought to my order. But maybe there is a chance to redeem myself by finishing my vow and additional models as penance. And big thanks to the Captain. It was a great event and you can be sure that I will participate again in the future. Until then, I will return to my studies. Farewell brothers! Edited by stuka06, 18 August 2012 - 02:04 PM. Instagram of the Munich based wargaming club "Hammer und Schild e.V. I take full responsibility for the poor performance of the Codex chapters. My leadership is certainly questionable and was unable to inspire the different chapters to succeed. I also went missing from my post for a crucial period towards the end (I blame the Alpha legion). I am ready to receive whatever punishment my Brothers deem necessary and serve a penitent crusade until I can redeem myself. Many congratulations to the Black Templars who's performance was scary to say the least. I must second Captain Semper on honouring Arizonajirt who certainly deserves the moniker Crusade Champion. Well done to everyone who competed, it has been a pleasure serving with you all. I daresay that this is the second massive undertaking within a year for the Good Captain Semper with regards to a Painting Challenge. I would like to petition that the Good Captain be elevated to the MODERATI so that he may continue this monumental work with the next Painting Competition hosted on the boards. He has already been recognized within the Dark Angel community but to elevate himself to unite the B&C community deserves recognition from the entire community. As I do not hold that power, I will submit it to the powers that be. What is the terror of death? That we die, our work incomplete. But what is the joy of life? To die, knowing our task is done. Thanks for all your efforts, Capt. Semper. It gave me, and certainly many others, the motivation to get some painting done. While progress is something Nurgle despises, all the corrosion I added to my models will certainly please him in the end. May death greet you all someday. Hey guys, just throwing this out there- maybe we could get some hellmarines in the new codex? They are like regular CSM but for +25 points they get the fleet USR. Hellmarines are a new cult unit that come with a Hellmark that gives them Hellfleet and Hellhammer of Wrath. If one of your HQs is Chaos Lord Helldark the Hellish, they count as scoring troops. I didn't think work would mess up my painting schedule that much... I did get a decent amount done (done as in accomplished not as in finished otherwise I wouldn't be in this position ). I will wear this badge to remind me of the promise that I wasn't able to keep. Now that I'm going to college my time will be even more limited and I realize this was to be a sort of last gig but now I blew it and failed my Codex brothers. That's quite the after-action report! Very well done indeed! I had a great time. It was fun to watch the progress charts over the week, and it pushed me to actually get knee-deep in painting my army finally. Good job Cpt. Semper. Now they're -all- wearing our insignia in their sigs. I am a bundle of stress and insecurities. Ignoring me is best thing you can do for 70% of the time. All Hail General Semper! That is the most comprehensive, in-depth analysis I have ever seen in relation to any event held within this hobby that we so love. I have to concur that every objective of the event was achieved well over expectation. As in real life events, often it simply takes one battle brothers will, motivation, drive and energy to create a wave of change, a change of mass proportions, a re-direction in the way events take place. We all witnessed that this year. Captain Semper's enthusiasm was infectious to say the elast first during the LPC 2012 when he helped the Dark Angels community to it's lofty heights. The ETL 2012 was designed slightly differently to try and harness the competetive elements of our hobby between the forums. I echo Captain Semper's sentiments in saying that I am proud to be part of the greater B+C community and in particular the Dark Angels Community here. Well done everyone who participated, as participation was the first prime goal of the event. I finally got started on my ravwnwing project that had been waiting on the sidelines for nearly 10 years. I am sure there will be many stories such as this that captain Semper will tell his great grandchildren in time to come over a flicking fire in the everglades! The Black Templar's have certainly gaied my respect with their community wide strength and fantastic and unrelenting effort in the ETL. The Spacewolves, in typical Fenrisian fashion wove together sagas of superb individual achievements. The eternal brotherly feud between the Wolf and the Lion shall continue. The Blood Angels, Chaos, Codex Chapters and the Ordos all had their moments of glory to celebrate. More than anything participation was the name of the game and completion the individual aim. The sheer number of points painted up is a healthy sign of our hobby and should have cleared some boxes in the storage spaces to the eternal relief of our partners/spouses/parents!! But last of all, what a blast, especially the last week. That was capped ony by this superb final report by Captain Semper! So the question remains, can he do it again? Was this simply beginner's luck? Was it a flash in the pan? Will the Dark Angels take this drubbing lightly? Will there be a Storm of Vengeance? That is the greatest victory!! Edited by The Shadow Guard, 18 August 2012 - 11:29 PM. Captain Semper, Master of Recruits again showed great feats of leadership and dedication; as well as creativity! This challenge must have been, to say the least, quite challenging to organise and run. And whatever the score Unforgiven achieved in this epic challenge; successful challenge itself is a victory alone! Thank You Captain Semper; thank You Brothers of the Unforgiven; and thank all participants, be it fellow Astartes, pious Inquisitor, or tracherous Heretic! Special thanks to our old brotherly rivals Space Wolves; for their great feats made us press yet harder, thus awaking the Unforgiven from slumber. Remembering our oaths, and the traditions in honour of an ancient titanic duel, known as the Lion and the Wolf, our sole goal became to be better than You Sons of Russ; and You gave us a worthy challenge indeed! Most importantly; I wish to congratulate Scions of Dorn, the zealous and resolute knights of the holy Emperor; the Black Templars! Yours is the service to the Mankind, answering challenges and taking vows is the core of Your creed, it is who You are; and I know no one better for this title than You Brothers. You earned this lauriel without any doubt! Wear it proudly, for You are indeed the Champions of the Unforgiven's Challenge! Edited by Uhr, 18 August 2012 - 06:58 PM. Though a victory for the Angels would have been great, the Black Templars really showed everyone up here. Just wicked performance by them to win this, so no shame in second. Thanks for all your hard work, Semper! Just this writeup is more work than many are willing to put forth. I am running out of area for painting badges in my sig though, so stop doing awesome things or I'll have to choose! Thank you everyone for making the event a blast to watch. There was really a frenzy of activity near the end that had me on edge. Captain Semper, a great report and many thanks for your involvement and commitment with this Challenge. Thanks to all those that participated and making this an exciting and fun challenge! Thank you Captain Semper, thank you all participating brothers. This has been a most welcome and enjoyable opportunity to paint, learn and have fun with and against brothers across the boards an chapters. Thank you all. Congratulations to the well deserving winners: The Black Templars. Well done. Until next time we compete or meet, have fun. And did I say it? Thank you all!